Imnane and Imlil valley are the two sides of one coin or two faces of contemporary rural Morocco. Imlil valley represents the modern Morocco with its extensive developmental activities, construction of new buildings, shops, restaurants. Imnane valley is an area where people still maintain to make their living in agriculture, planting and herding The massive terraced fields of this narrow valley with a river stream splitting it in halves bring peace in mind and together with a great panoramic views from every pass create a wonderful background for contemplation. Our driver will pick you up from your riad/hotel in Marrakech at around 8 am, and drive towards the High Atlas Mountains, passing by the Moulay Brahim Gorges, Asni village well know with its weekly Berber market every Saturday, then to Agersioual village (1600m), set in the upper level foothills of the Western High Atlas mountains. Here we shall leave our vehicle and meet your local guide and muleteer/cook to take a welcome glass of mint tea in the village then start our day trek towards the Imnan valley, via the mountain pass of Agersioual (2100m), which offers an amazing panoramic views overlooking the 2 valleys Imlil and Imnan valleys, after a short break at the top of the pass, we walk down towards the Imnan river overlooking several other Berber villages such as Amsakrou, Tashdirt etc, to rich the Berber village of Ikkiss which is located on the left side of the valley, we will have a small break at the village in order to have a cup of mint tea in a traditional local Berber home-stay. Then we carry on along the river side to rich the village of Tinghrine where we will have our lunch near the river, prepared already by our Cook. 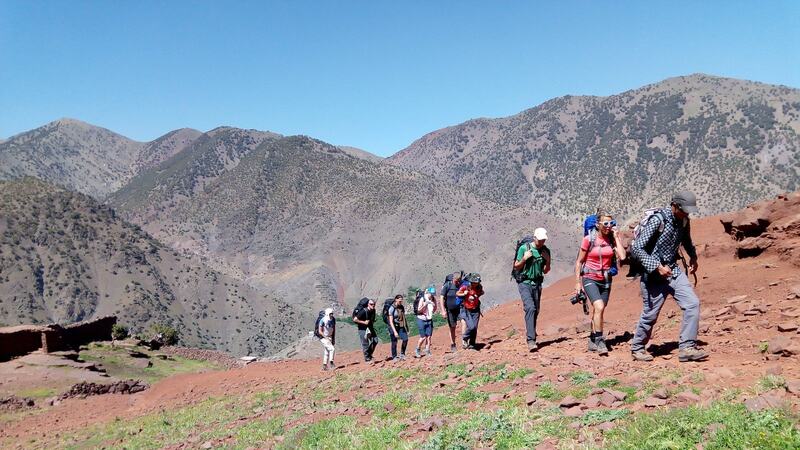 After lunch we continue our walk up to Tizi N’Tamatert pass (2300m), where we can enjoy a fantastic panoramic view overlooking the neighboring high atlas peaks and Imlil valley with its villages. After our break at the pass we will carry on walking down to Imlil town the end of our day trek, meet our driver to take us back to Marrakech.